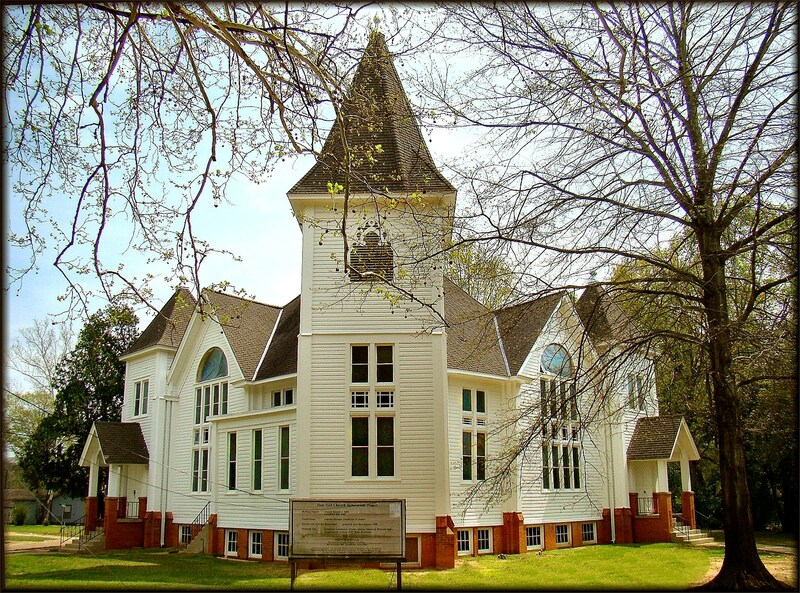 Zion Hill First Baptist Church, the oldest African-American Baptist Church in Nacogdoches, was organized in 1879 under the leadership of the Reverend Lawson Reed. Meetings began in a brush arbor on Mound and Logansport streets and later moved to a one-room frame building on Park St. west of present day Zion Hill Cemetery.7 In 1914 the church occupied the new building at 324 La Nana St. north of historic Oak Grove Cemetery. In addition to naming five original deacons of the church the marble cornerstone names the pastor and reads: "Erected in 1914 J. C. Sweeney, P. C."
Diedrich Anton Rulfs (1848-1926), German-born architect who migrated to Nacogdoches in 1879, designed Zion Hill Church at the request of John Schmidt who also financed the land and the building for the new church.7 Zion Hill Church and the Christ Episcopal Church at 502 Starr Avenue are the two remaining examples of Rulf's ecclesiastical architecture, both in the Gothic style but each an individually unique form. The Gothic Style of Zion Hill Church is expressed in its irregular form and orientation; its emphasized verticals, contrasts, and oppositions; and its ecclesiastical symbolism. The form and orientation of Zion Hill Church is dynamic and enigmatic. The basic 6 sided structure sits at an oblique to the rectangular block in which it exists. The main tower, which connects the two identical but opposing faces of the church, is the only part conforming to right angle symmetry characteristic of the world of city blocks and streets beyond itself and acts as a mediator between this condition and the different geometric angles of the church. The form suggests a sense of movement in three directions: ascensional through the aspiring verticals; outward through the points of the triangles in the landscape not contained within the building's space; and circular through the six planes of the church that project continuous forward movement around its sides, none of which create the sense of a major focal point or justified center. The structure creates the impression that the church may be approached from all directions, even by opposite or opposing doorways, and that its center may not be understood through the facets of its external form. The Gothic emphasis on the linear and vertical, as opposed to horizontal volumes, is seen in the five sharp angles of the three towers and the two gables above the main windows. The lancet shape of some of the windows and the vents of the main tower, and the three-row stack of narrow, rectangular windows in the main arches also emphasize height and verticality. These spiky points of the church contrast to the central dome which rises to an 8 sided lantern reminiscent of the top of a lighthouse. Its compact design is uncharacteristic of the longitudinal nave of Gothic structures but is associative with the nautical image of the church as a vessel or ship. When viewed from the front toward the main tower, whose lancet-shaped vents contain the woodwork patterns of curving wavelets and the fluke of an anchor, the tower becomes the rising bow of a great ship whose sides curve sharply downward over the 2 gables and the 2 lesser towers. In this instance the lantern at the center would occupy the place holding the main sail of the ship. Church symbolism as a characteristic of the Gothic style is expressed in the number and placement of windows and towers in Zion Hill Church. The numbers 1, 3, 12, and 24 seen in the series of windows from the lantern at the top through the trefoils down to the collection of windows in the two arches are symbolic of light as authority and governance that descends by degrees from a single controlling source to diminishing points of power. In the religious context one is divided into three and then into twelve which becomes twenty four when the windows of the 2 opposing arches are combined. Three is the essential number of the church. There are 3 towers and 3 levels of windows in the arches under the gables. Both doorways and the large windows under the arches have sets of 3 trefoils above them. Each of the 2 main faces of the church rise to 3 sharp angles in the two towers and an arch of collected windows. The movement of the planes and points of the church are in 3 directions; vertical, horizontal and circular. The outer 3 towers are the container of the inner volume of the church which consists of 3 metaphoric sections of lights relating to degrees of authority proceeding from the one lantern at the top through the three trefoils and down to the twelve windows in each of the arches. The number 3 resolves the tensions contained in a 2 dimensional linear structure, here the oppositional doorways and faces of the outer church, by giving its form volume and cyclic process which is a basis for harmony and symmetry. The membership of Zion Hill Church in 1987 moved to a new sanctuary located on East Stallings Drive. The present building was used by a community action program for a time but is now unoccupied and in the process of restoration as a fine example of early 20th century Gothic church architecture in Texas---and one that connects to a diverse body of work by a known architect, Diedrich Anton Rulfs, whose designs are the major contribution to the visual and architectural history of Nacogdoches as the Oldest Town in Texas.